Just last year we entered into the world of children’s athletics. Between our kiddos, we’ve participated in four sports seasons, which has resulted in four trophies. This isn’t because my children’s teams won a season championship, or even because one of them was picked as Most Improved or Best Sportsman. We have trophies simply because my children showed up, and we paid our registration fee. That’s right – they are participation trophies. 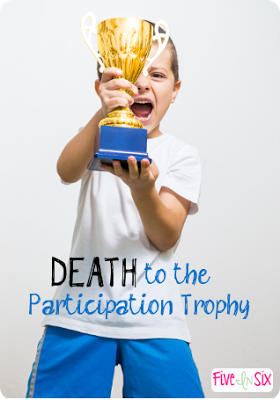 Now, I realize that the term ‘participation trophy’ doesn’t really make sense. The dictionary definition of trophy is “an object (such as a large cup or sculpture) that is given as a prize for winning a competition.” Okay. So maybe it should be called a participation award, then. Oops. An award is defined as “something (such as a prize) that is given to someone or something for being excellent or for doing something that is admired. A prize or other mark of recognition given in honor of an achievement.” Last time I checked, showing up isn’t an achievement. Unless, that is, if showing up means you make it to church on time with five children who are all actually clean, dressed in seasonally appropriate clothes that fit and have on a left and a right shoe of the same pair, while the hubby is traveling. That’s an achievement. One that I have yet to attain. And if I do someday, I’m guessing nobody is going to hand me a trophy. Though should it ever happen, I’m pretty sure I’ll reward myself. Here’s the truth of the matter – if everyone ‘wins,’ winning is stripped of all meaning. Being rewarded for just showing up, or even just signing up, doesn’t make a lick of sense. Why should the kid who jacks around in practice and doesn’t listen to the coach get the same award and recognition as the kid who consistently gives it his all and faithfully practices at home every night. He shouldn’t. The latter will more than likely develop into a decent athlete, if not a gifted one. His attitude and hard work should be rewarded, rather than diminished by the awarding of team-wide participation trophies. No where else in life does it work this way. No one gives you a gold star for paying your taxes or mortgage. No company is going to pay out a bonus for just coming to work. The guy who regularly exceeds expectations is going to extra cash. Or the woman who sold more business than anyone else on her team. That’s who gets an award. In real life, recognition and reward has to be earned. Awards for participation create a socialist kind of attitude. People figure out really quickly that there’s no need to work hard if they are going to be rewarded or paid the same amount as the people who do just the bare minimum of what is required. Capitalism is based on the idea that incentives matter and make a difference. If extra effort doesn’t result in extra incentive, then people no longer make that extra effort. We are starting to see what participation trophies create, and man, it is ugly. 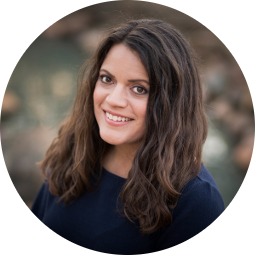 Friends of mine who work in the business sector have shared at different times about the number of college hires who show up and aren’t willing to put in as much work as everyone else. They leave at 5:00 pm even when there is a looming deadline and the rest of their team is still hard at work. Why would they need to stay late? They’re so gifted and talented, proven by all of the meaningless participation trophies on their shelves. Their work colleagues are lucky they even get the opportunity to work with them. At least, that’s what they’re thinking. And why wouldn’t they? Every childhood drawing they ever produced was praised as “outstanding,” every average story written as “stellar,” and every lackluster performance on sports teams earned them trophies. Then, these hot shots begin to feel taken for granted because no one has given him a ribbon in awhile. No one stops by his desk and says, “Man, you’re sure doing a great job!” because he isn’t. Turns out, he’s just average. But, he’s a praise junkie, and he’s used to receiving accolades out of no effort of his own. He doesn’t understand why he isn’t getting the recognition that he is used to. Going forward participation medals or trophies will be going away. KYA Football board feels that giving participation medals or trophies isn’t sending our children the right message. Trophies are something you should strive for and earn. Life does not give you a participation job or medal, life makes you earn everything you get. We know not everyone will agree but we feel this is the right direction for KYA Football to go in. Amen to that! Now please hear me. I am not saying that winning is all that matters. In fact, I do my best to focus most on the effort and hard work that my kids put forth, rather than whether or not they win the game. It’s important to help children find something they are good at and enjoy, and then encourage them to always give it their all. So do your kids a favor. Keep score at the ball game, reserve lavish praise for when it’s actually deserved, and then love them fiercely with your whole heart. Because love should be given freely, but accolades should be earned.